Arduino is a perfect mindless slave. Give it a job and it performs the task endlessly without defaulting even for a nano second. On the other hand, Raspberry Pi, or Raspi, is a computer that has a brain of its own. But, it may falter as it gets busy doing some other job at that moment. Imagine a situation where Arduino is doing the job and Raspberry Pi is supervising it! Described here is a temperature indicator project using Arduino and Raspi boards. A temperature sensor such as LM35 gives analogue output. 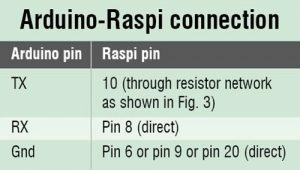 Arduino has analogue pins whereas Raspberry Pi does not. LM35 is interfaced directly to Arduino analogue pins and then connected to Raspi. It displays the temperature on the terminal. Let us see how. Arduino development boards are available in many variants in the market. I have used Arduino Uno board for this project. The LM35 temperature sensor is easily available in India. It produces analogue voltage directly proportional to temperature with an output of 1mV per 0.1°C (10mV per degree). The sensor has a temperature range from -55°C to +150°C. The sketch (program) converts analogRead values into millivolts and divides these by 10 to get degrees. 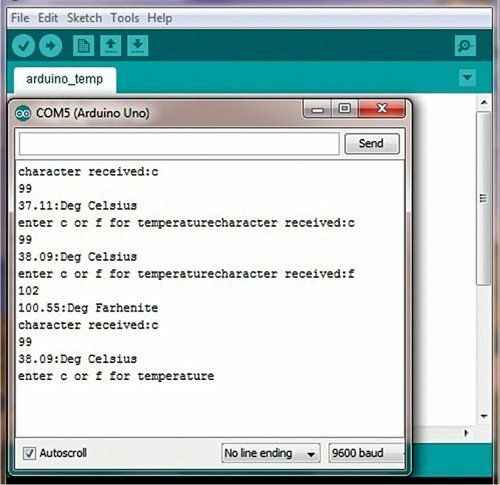 Run the sketch by opening Serial Monitor in Arduino IDE and write c to get temperature in Celsius and f to get temperature in Fahrenheit (Fig. 2). Remove console=ttyAMA0, 115200 kgdboc=ttyAMA0, 115220 line. Save and exit. Reboot your Raspi so that everything comes into effect. Arduino will sit on top of Raspi and then interact with the LM35 sensor. 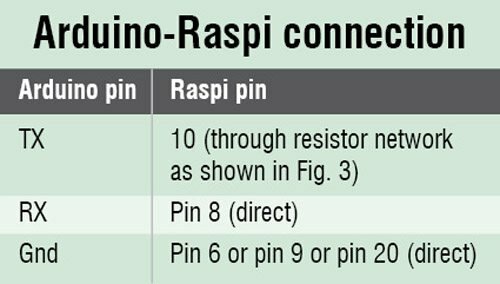 Arduino will give data to the serial port of Raspi.